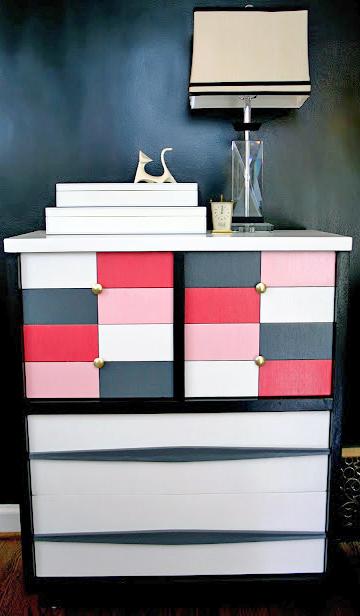 This fun and funky contemporary dresser was entered in The Fab Furniture Flippin' Contest_ for September whose theme was "Geometric Design". Awesome job Somewhat Quirky Design_! I used all General Finishes products to complete this dresser. The gray and black parts were stained with 2 coats of General Finishes Gray and Black Gel Stains. If you've never had a chance to work with gel stains you're missing out. I find them so much easier to work with than liquid stains. They are so easy to control. I was actually able to use the black stain on the small areas between the squares on the drawer fronts without bleed through. I used the General Finishes Milk Paint in Snow White and Coral Crush to paint the rest of the piece. The lighter pink was a mix of 8 parts Snow White to 1 part Coral Crush. I believe that I used 4 coats of the white and 3 coats of the pinks. The entire thing was coated with 3 coats of the High Performance Water Based Top Coat.